Once upon a time, I used to be able to break 90 on a regular basis. In fact, not breaking 90 would cause me endless frustration and sleepless night of wondering if my game is going bad. That was when I still had fantasies of playing golf for a living. Nowadays, I’m pretty much resigned to the fact that no matter how much time I spend on this blasted game, I’ll find ways to sabotage my score over and over. With this new found enlightenment, I found peace and equilibrium in my life and once again, golf was about the laughter, enjoyment and paying the price (literally in the form of bets) for having a swing resembling a gopher doing the macarena. So, now, when I do break 90, it’s a big deal. 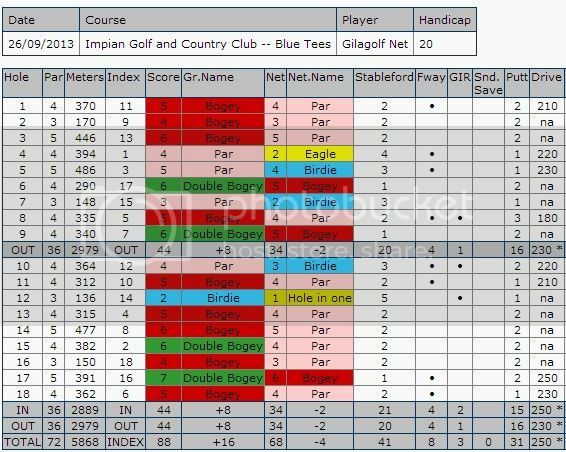 I managed to do it today at Impian, which I must say, is getting to be my favourite course. The minus points were the double bogeys I created. Hole 6 was just a bad idea…I just got a RazrX Callaway Stiff shaft which I can’t hit, so I used it and promptly skulled the ball 30 meters in front. Ended with a double. The other double was Hole 9, where I duck hooked my driver into the water on left. Index 2 double bogey on 15th was just a bad shot from the bunker which ended into the water as well. And hole 17 was the worst. This easy par 5, I drove my best drive and was only a nine iron away from the green with my second. I had to go through trees unfortunately and landed short of the bunker. I duffed my flop into bunker, skulled my bunker shot to the other end, managed to 5 on and two putted. After a drive that left me with a 9 iron to the green. You win some and lose some I guess. Impian was in great condition. The greens were still massively good. In fact I managed to sink some ridiculous putts, including a 30 foot bomb on the 7th. The price is a turnoff though, but with the Top Premier voucher, we got 90 bucks each, which is an excellent price for the course. Go for it!